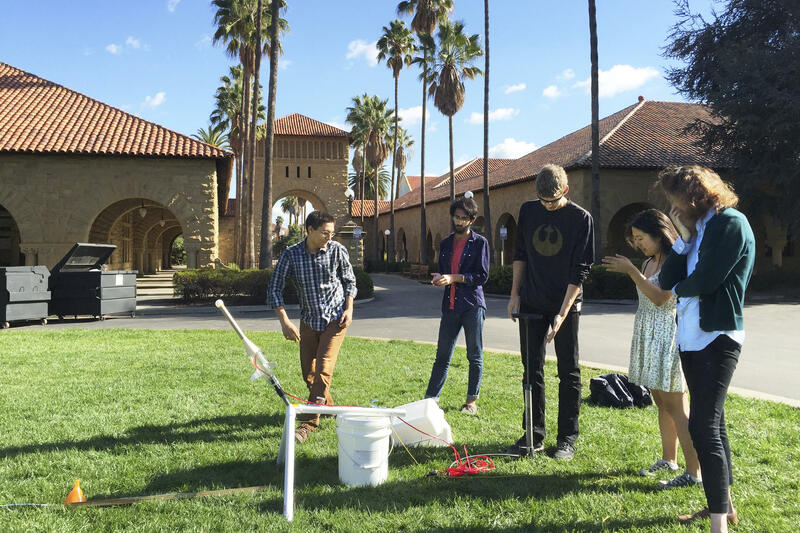 Students prepare a rocket launch for a science class on the campus of Stanford University in Palo Alto, Calif.
"It's a very good analogy," the Stanford professor says. "You let some blood out and go away and they get well. Was it bloodletting that did it, or something else?" The large college lecture — the cornerstone of undergraduate education in America and much of the world today — is similar, Wieman argues. "You give people lectures, and [some students] go away and learn the stuff. But it wasn't that they learned it from lecture — they learned it from homework, from assignments. When we measure how little people learn from an actual lecture, it's just really small." For Wieman, the fact that most colleges and universities don't even bother to systemically measure teaching quality is the bigger problem festering in higher education. Administrators, he argues, are instead obsessed with publishing and research funding, which remain the bedrock of tenure and promotion. "The quality of teaching is not something that university administrators are rewarded for, and correspondingly know or care about," Wieman says. "If they improved the quality of teaching by 100 percent and in the process reduced the amount of research funding and publications by 1 percent, they would be penalized, since the latter is carefully measured and compared across institutions, while the former is never measured." Wieman won the Nobel Prize for physics in 2001 for creating what's called Bose-Einstein condensate in a dilute gas, or, as he puts it with a grin, "getting atoms really, really cold and they do weird quantum things!" 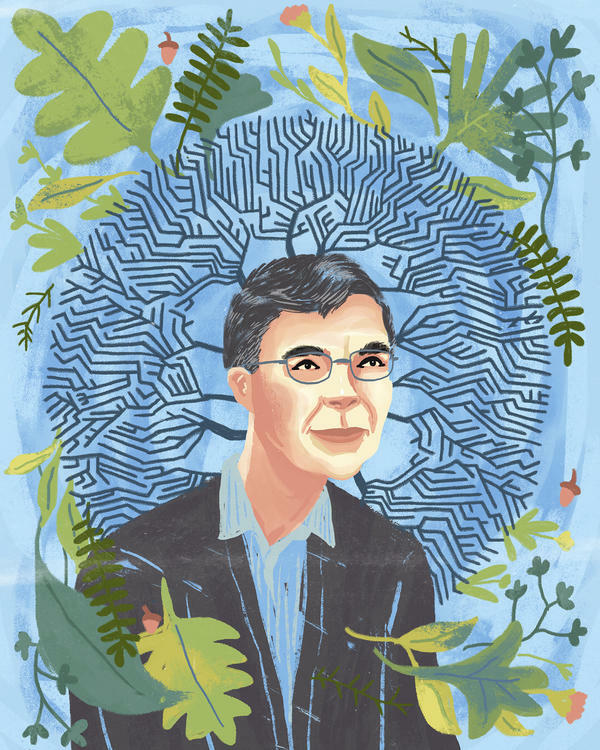 As a scientist and experimentalist, his work as a professor in both Stanford's physics department and its graduate school of education is driven by data. For years, even before arriving in California, he'd measure the effectiveness of lectures versus other evidence-based methods of teaching. He'd give a lecture. Then, 20 minutes later, he'd follow up with a multiple-choice question from the material he had just covered. Handheld electronic "clicker" devices would record the students' responses on his computer. Most of the time, he says, "only 10 percent would actually remember the answer. A lot of them are asleep, or lost, and I don't know whether they're getting anything out of it. If I'm standing up there talking at them, I have no clue what they're absorbing and not absorbing." Convinced that big undergraduate lectures are ineffectual, Wieman long ago ditched those big performances in favor of getting students to problem-solve. He gets them actively engaged with course material, working in smaller groups. The techniques have become known as an evidence-based, "active learning" style of teaching. He starts the class with some slides. "We've talked about how to get even one wave packet like that if we just have a single value momentum," Wieman says, offering up a kind of mini-lecture. But Wieman quickly switches to giving these undergraduate physics majors a problem to discuss and think about in small groups of four or five. As students talk through the problem, he walks around the room, just listening in on conversations. He chimes in if a group seems stuck. "OK, so you can think about how you might produce something like that?" he tells one group. "That's your challenge." Wieman sees himself as a kind of cognitive coach rather than the classic "sage on the stage," delivering knowledge. His lecturing, such as it is, is merely to prime the undergrads to grapple with the concepts and key questions on their own and try to figure out what's important — or not. "I'm doing my best to understand what's going on in every one of those students' minds and challenge them and monitor how they're learning," Wieman says. "If I'm just lecturing the whole time, what a terrible waste that would be. Half the material would be over their head, and half the material would be completely trivial to them." His techniques are grounded in data, and evaluations of active learning methods — published in several peer-reviewed journals and science publications — show that students get a deeper understanding of the material and retain more knowledge. In some cases, the failure rate fell by 12 percent. Test performance went up by half compared with pure lecturing. In fact, Wieman argues, the data on the power of these techniques are so persuasive, it's almost unethical to teach undergraduates any other way. "I know you can double how much a student learns depending on what method the instructor is using." But if the research, so far, is so convincing, why haven't more colleges and universities adopted these teaching methods? It's not a matter of budget, Wieman contends: "The amount of time needed for faculty to learn to teach using these better methods is a small fraction of the annual budget of any science department, if the faculty want to learn." "I don't think Carl is tilting at windmills at all," agrees Dan Schwartz, dean of Stanford's Graduate School of Education. "You need to get this in the air; you need to let people know this is possible. Somebody's got to do this." Schwartz shares some of Wieman's passion for the need to overhaul undergraduate teaching. He's seen the data on active learning in science and his own field of cognitive psychology. The large lecture, and racing through material, he says, "doesn't allow you to slow down to see the beauty of what you're learning." The goal, he says, is not to train students, but to prepare them to learn once they leave. "But a lot of the college instruction is still kind of a training mentality: They have to have mastered this before they move into the next course. I think that's a mistake." But Schwartz has a somewhat different explanation for why the tenets of active learning have yet to be more widely embraced: "The literature on how to do this stuff is a giant mountain of goo." In other words, he says, "I can tell people they need to teach better. But if I don't give them things that are easy for them to implement, they won't do it." He says it's much the same story in K-12. And, like teachers everywhere, some professors are simply reluctant to change, or see lectures as vital and an art form. Wieman, for his part, is convinced that the biggest structural obstacle is higher education's entrenched tenure machine. Advancement and promotion are still far too focused on productivity, research and research dollars, with little or no regard to undergraduate teaching effectiveness. "Are faculty teaching using the most effective methods at Stanford versus Harvard versus Ohio State? There's no way you can find that out. They don't even look at it! It's like you've got a hospital and you're not bothering to check if your doctors are using antibiotics or bloodletting," Wieman says. And many top administrators, he says, don't seem to care. "Of the 30 presidents of leading universities that I have met, I have never encountered one that knew anything about the research on learning or the comparative effectiveness of different methods of teaching." Only a handful of universities — mainly at the department level — have adopted these teaching methods in a major, sustained way. At Stanford, the physics and math departments have begun adding innovative, active learning techniques to some introductory math and core physics courses. Wieman says the results have been striking: Students in the active learning sections did substantially better than the students in the traditionally taught classes on all common exams. Attendance and positive feedback to professors rose substantially as well. Other schools are adopting these new techniques as well — some of them places where Wieman has taught. One is the University of Colorado, Boulder, which, as we've reported, helped launch a national effort to improve science education on campuses and K-12 classrooms. Another is University of British Columbia in Vancouver, where Wieman also taught. Ironically, it was one of his lectures on the death of lectures that inspired a professor of teaching there, Sara Harris to put aside her research on paleoceanography to work full time on improving science education. "First term here, I saw a talk by Carl. And I thought, 'That's what I want to do,' " Harris says. With Wieman's help, she says, most science professors at UBC have substantially changed and improved how they teach. But relatively few other institutions have followed suit. Wieman believes that until administrators and faculty leaders prioritize teaching, schools will continue to shortchange undergraduates. "Improving education is a profoundly important issue in the modern world," he says sitting in his Stanford office. "There are a lot of really hard problems that you don't know how to solve. And this is one I and many others do know how to solve." The hard part may be convincing more people to sit up and pay attention.